The Kanban Maturity Model (KMM) collects and summarizes a decade of experience applying Kanban across different organizations. The model can be a useful tool for organizations interested in developing their business agility. It will provide you with a framework for scaling Kanban and evolving your process to achieve robustness and agility, ensuring your company’s long-time survivability. 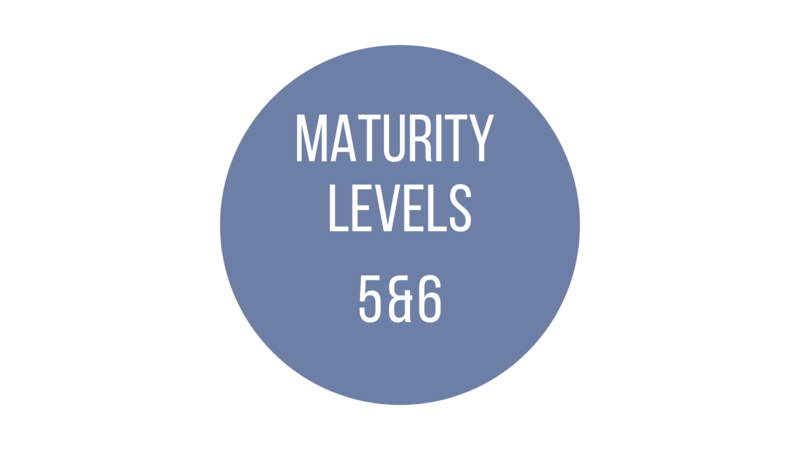 KMM has 7 maturity levels, but before we explore the model in details, let’s briefly describe its benefits. At first sight, the KMM may look pretty complex. However, by advancing through the different stages, you will realize that it will help your organization in a variety of ways. For example, you’ll be able to relieve your staff from overburdening, make your process more predictable and sustain stable workflow. In addition, you’ll be capable to deliver faster to market, be more agile, establish a shared purpose and strengthen ?rganizational values. It is important to understand that each level of the model includes transition and core practices. The transition practices will help you overcome potential resistance. By implementing them, you can facilitate the transition between maturity levels. The core practices are necessary in order to achieve the outcomes that define a maturity level. However, an organization at the lower level will tend to resist or repel them unless some preparatory work is done first. Without further adieu, let’s discover the model and see how you can apply it in combination with Kanban software tools for maximum efficiency. If your organization is not aware of the need for structured work process, you are a definitely at maturity Level 0. Most organizations at this stage don’t have a systematic approach to organizing the way they work and it may seem difficult to apply Kanban on a team level. This is why you need to start by visualizing work on a personal level. You can either do it on a physical or an online Kanban board. The purpose here is pretty simple. Individuals need to realize the benefits of visualizing invisible work and the need for limiting work-in-progress in order to become more productive. Ultimately, your team will be ready to start the transition to maturity level 1 when individuals realize the need to prioritize what needs to be done next from the pile of tasks in their backlogs. At this stage, it is crucial to realize that limiting work in progress helps you avoid multitasking and reduce lead times for delivering tasks. If each of your team members is already here you can go to the next phase. At maturity Level 1, team members already have built the habit of using Kanban on an individual level. After individuals start to recognize the advantages of simple workflow visualization, it is time to transmit the benefits of Kanban from an individual to a team level. When initiating the transition, you should migrate all the work from the individual boards to a shared Kanban team board. In the beginning, it will be easier to differentiate between work items by using swimlanes. Each swimlane can be dedicated to a certain individual. This way team members will easily recognize their own tasks, but in the same way, they can easily see what others are doing. Still, there isn’t a consistency of the work process, but you will notice increased levels of team collaboration as well as an inceptive culture of shared responsibility. You can do it on a physical Kanban board, but it will be much easier to build the shared Kanban board online with a few clicks. Plus, it will be much easier to collect workflow data, which you will need to advance further with the model. If your team already has the confidence of sharing responsibility and common goals, then it is time to remove individual swimlanes and apply avatars. So now, the whole team shares a common workspace and tasks appear in common pools, but still, everyone is responsible for their own tasks. However, the team begins to acquire a clear understanding of the overall process. An important step is to define and visualize initial policies. These are like norms or rules that the whole team agrees to follow for the sake of normal functioning and improving work process. On a digital Kanban board, it will be very easy, because they usually appear at the bottom of each column and everyone can access them in a blink of an eye. While every team member has their dedicated swimlane, you need to limit the work that can be in progress for each individual. Taking this into account, you can try to calculate per-person WIP limits by simply observing, for example, the number of tasks that can be finished in 3 days and this will be the WIP limit. In other words, if Janett is able to deliver 4 work items in 3 days, then her WIP limit will be 4. This way you will prevent each individual from overburdening. It is important to note that you need to take into consideration the size of the work items that your team members work on before being able to set the most adequate WIP limits. When you move to a joint Kanban board, it is time to set team WIP limits. It is always a good idea to back your decision up empirically and this is why it will be much easier for you to use an online Kanban solution. Kanban software solutions usually collect historical data about your team’s workflow and you can easily determine what the WIP limit should be. For example, you can see the weekly throughput of your team and set it as a WIP limit. In other words, if your online Kanban software tells you that your team completes 6 tasks per week, you can set it as a WIP limit. Keep an eye on the reasons that cause WIP limit exceeding. This will help you gradually decrease them until you reach a state where nobody is multitasking. Another good reason to use Kanban software. You can easily see “WIP limit exceeded” reasons with a few clicks and analyze them later. Additionally, you can also set business rules that raise alarms when limits are reached or exceeded. This can reduce waste activities of moving and counting cards especially if your team is big enough to generate a decent amount of tasks. Last, but not least, the great thing about team WIP limits is that they foster collaboration and encourage knowledge sharing. So far, your team realized that using Kanban will boost collaboration and bring transparency to the work process. The next step is recognizing the workflow. In other words, the team starts to understand the way they do things. Reaching this stage means also that the team probably starts to see and realize the need for a defined work process, and how work items get done. 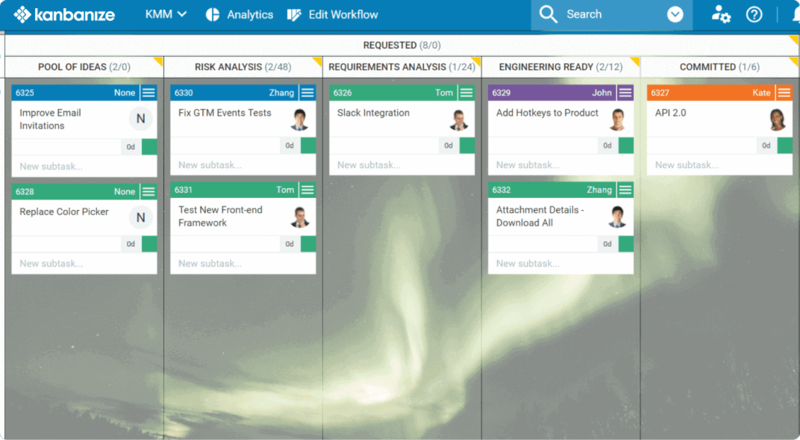 Until now your team used the Kanban board to simply visualize work tasks. However, from this stage, your teams will see the real value of the visualization practices. First of all, an online Kanban solution will give you the freedom to swiftly apply any changes to your team’s workflow. Having this in mind, you may restructure your Kanban board and apply some principal stages of your workflow. After this, you can apply color codes for the different types of work or use swimlanes for the same reason. For example, yellow cards will be bugs, blue cards will be features and so on. At this stage, it is very important to start visualizing blockers. Shortly explained, they are unexpected events that obstruct continuing work on a task. If you use Kanban software, it will allow you to collect insightful data about different blocking reasons. At any time, you will able to extract a detailed report with a few clicks and analyze which block reasons cause the most process issues. Being here already gives you the confidence to expand your board and this is a good moment to slice the discovery stage of your work process or the backlog. 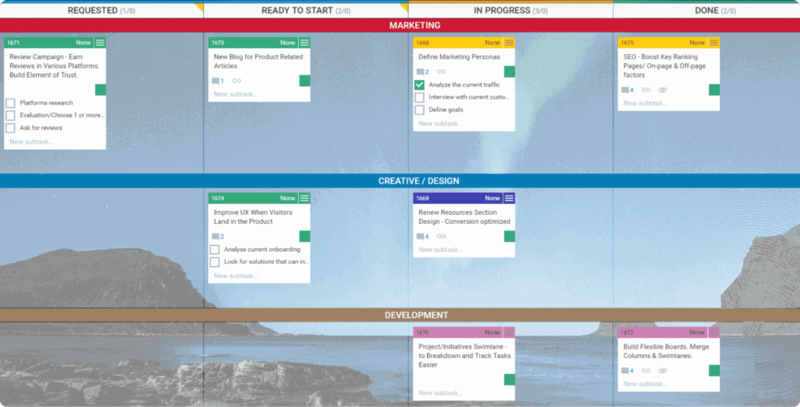 Instead of just throwing all the ideas in one place (the backlog) you can separate the discovery stage into a few phases which will help your team prioritize more efficiently and move tasks faster. But not just piling up ideas. Before we go to the last step, you first need to visualize individual WIP limits. ?heir goal here is to serve as secondary limits. Applying both team and individual WIP limits may prove to be necessary when more than one person works on a card. Imagine that the card has one assignee responsible for its completion, but there are multiple subtasks that require other team members to assist. If the individual WIP limit is not in place, the assisting person complies with the team WIP limit but risks getting overburdened due to their participation in the processing of other cards. Last but not least, you need to visualize the process policies. The policies should be clear and explicit. When using a Kanban software, it will be very easy to apply them. For example, they can appear at the bottom of each column describing under what conditions a task should appear or be forwarded. Another example is that your team will be alarmed immediately if a WIP limit is reached or exceeded. Without further adieu, here is what you need to know. Sometimes, several team members can work on a single work item. In these cases, you can apply subtasks or checkboxes and only when all subtasks are completed the task can be moved to the next column. Furthermore, you can also use swimlanes to distinguish between tasks that need to be performed in parallel. With the next step, you can apply swimlanes to split tasks that require different skills. For example, you can have separate swimlanes for different activities such as UI design, Security and so on. This is also the right place to visualize defects and any other rework types. You can do this by using a specific color for this kind of tasks or a separate swimlane. This is an important step because it gives you the opportunity to reduce wasteful rework activities. Another important step is to apply constant WIP (CONWIP). At this point, you probably already divided the In Progress area of your Kanban board into different work stages. Putting a WIP limit on the whole In Progress area will help your team acquire a better understanding of the whole product development process. At this point, it is important to begin upgrading your Kanban board on both discovery and delivery stage. As mentioned earlier, the discovery stage, usually considered the backlog, is where ideas are born and later become actionable items and move to the delivery stage. Adding more stages to the workflow will help you see the whole value stream in details and move work faster. For example, a discovery stage of your workflow may start with a column named “Ideas”. This may be followed by “Opportunities” column where you pull ideas recognized for future development. Then you may have an analysis stage to divide work that will be pulled in distant or near future. The same principle applies to the whole workflow. The more you advance with Kanban, the more you will realize the need to put more columns. And this is not just for the sake of using columns, but to visualize all possible steps that a task can go through. This way you will start identifying where work gets stuck, where work gets blocked most often, where the value is added. 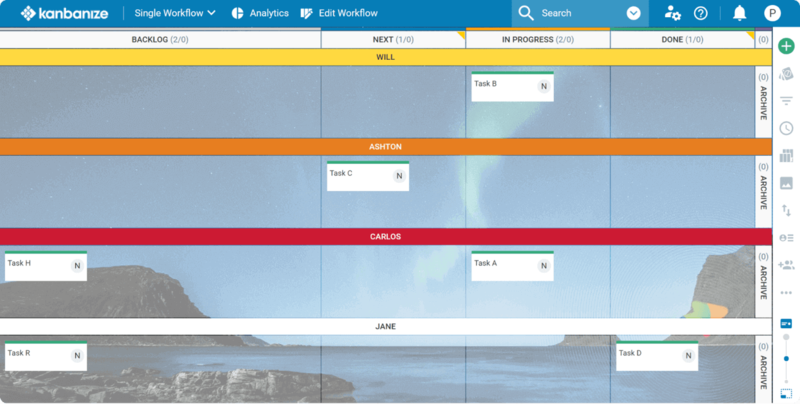 Finally, before starting the transition to Level 3, you should outgrow Team Kanban and create a Portfolio Kanban board where your large projects are to be visualized as cards and broken down into assignments linked as children on your teams’ boards. Depending on the progress of the children, you should move the project initiative further towards Done. Establishing activity based WIP limits allows you to manage team capacity with consideration of the types of work items that comprise your workflow. You just have to put a maximum limit to the number of tasks from a given type that can be in progress. Next, you’ll need to apply a constant limit to the total amount of work in progress. Also known as CONWIP, this is a more advanced way of keeping your flow stable by keeping the same amount of items in progress all the time. If the limit is higher than your capacity, your team will be multitasking. If it is lower, then you’ll have team members idle occasionally. The transition period of this maturity level consists of just one, but very important step – defining work types based on your customers’ requests. Once you define them, be sure to visualize each type in a clear way on your Kanban board. You can use different card colors, markings, or any other way as long as there’s no chance of confusion. 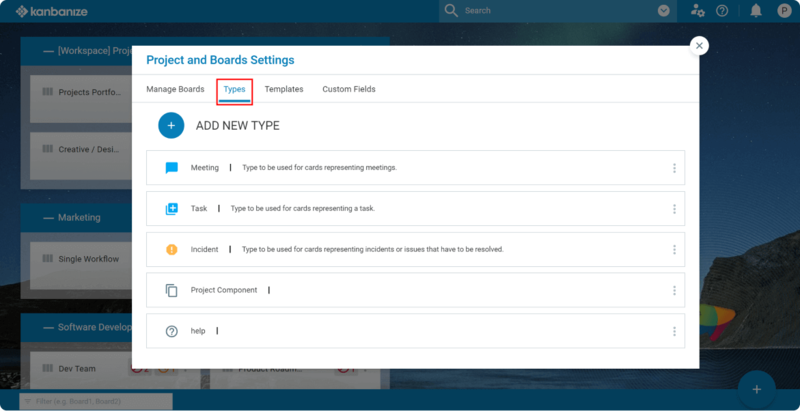 For example, in Kanbanize you can define work type templates that automatically apply to freshly created cards of a specific type. Such cards are marked with a distinguishable icon. At the core of maturity Level 2, the concept of Upstream Kanban appears for the first time. It is related to all the steps that are part of your process before committing to deliver an assignment. The upstream states reflect the steps through which ideas or requests go before reaching commitment to be delivered. For example, these are generically Opportunities – Synthesis – Analysis – Ready to commit. 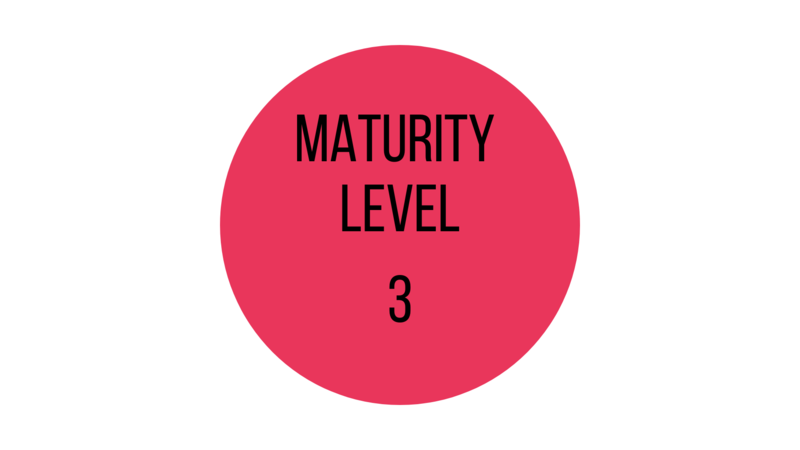 To advance further towards maturity Level 3, you need to start managing your blocking issues. 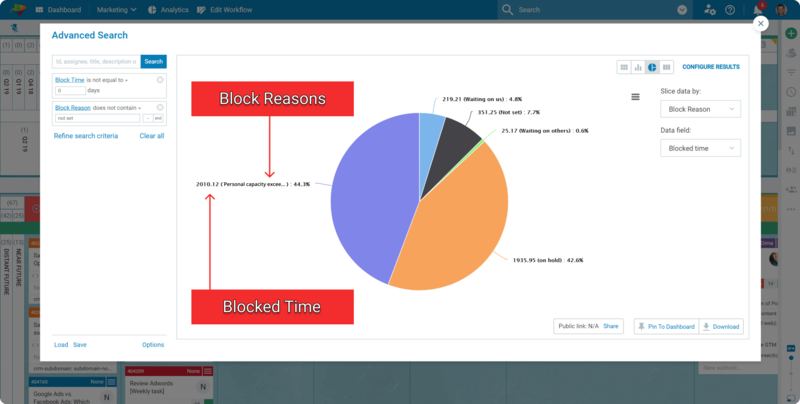 Visualizing them is important but you need to systemize blocking issues and discuss with your team long-term solutions to commonly occurring blockers. A good way to classify your blockers is to prepare different avatars for all the problems that you face. 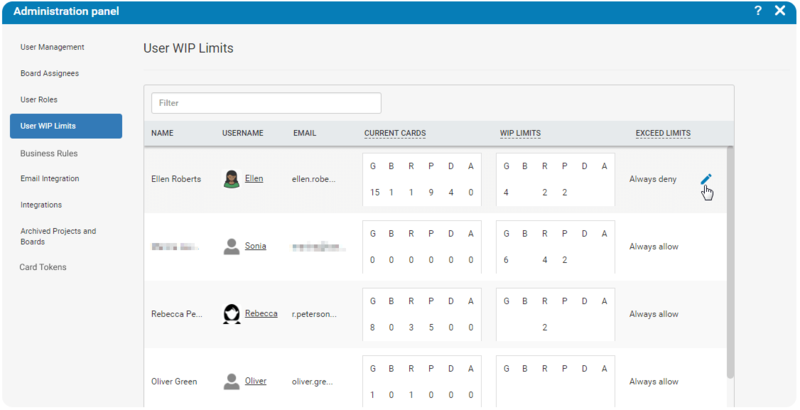 For example, if you are using Kanbanize, you can create custom blocker avatar templates. You can define a distinguishable icon and list any relevant information concerning the blocker inside. Finally, to say confidently that you are at maturity Level 2 in regards to flow, you need to start managing defects and other work types. A simple way to do so is preparing a dedicated swimlane for work items of this sort that need to be expedited. We advise you to place it on top of your board and make it as simple as possible (regarding process steps) so that cards can move quickly from Requested to Done. A good practice would be to give the highest priority to such tasks and adopt a policy that allows team members to drop anything they are working on to immediately start fixing the issue. The only exception should be applied when everybody is working on items that are to be expedited. Without going into detail about these practices, we would like to advise you to keep everything related to policies and services transparent to your team. 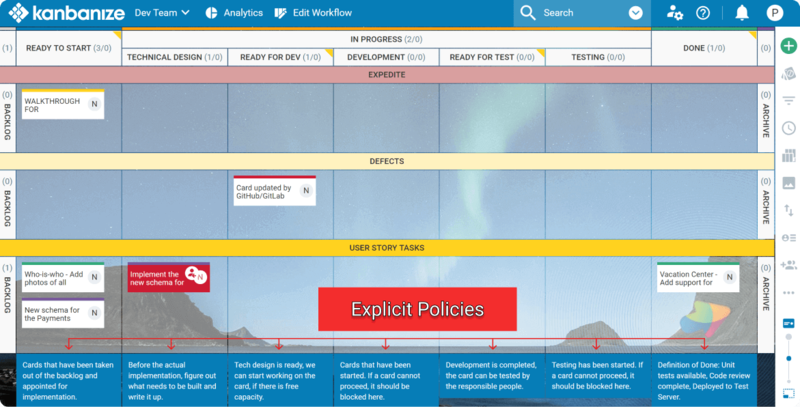 Make sure you make the most of the visualization capabilities Kanban provides and continue developing the feedback loops related to maturity Level 2. The last step towards achieving maturity level 3 is related to identifying sources of dissatisfaction and problematic policies. By the time you rise to maturity level 3, you should have a definition of a process, workflow, policies, and decision frameworks. It is important that your whole team agrees on all of them and understands how they help them achieve better results. At this level, your main focus should be on evolving further your Kanban implementation of pretty much all of the 6 core practices. As you start to outgrow maturity Level 2 and begin the transition from a customer driven to a fit-for-purpose process, the practices related to visualization advance upstream. To initiate the transition, you should set up a new column on your Kanban board dedicated to items that are ready to be committed. This step has the goal to distinguish between requested items that are ready to be pulled in progress and all the rest that await their turn sometimes in the future. Logically, you should put it right before your first progress step. Next, you need to make sure that your team sticks to that order and doesn’t pull items that are requested but not placed in the upstream column. The best way to do so is making it explicitly clear what should happen with the items in the column. It is wise to give it a name such as “Next”, “Ready to Start”, “Ready to commit”, “Ready to pull” or something similar. 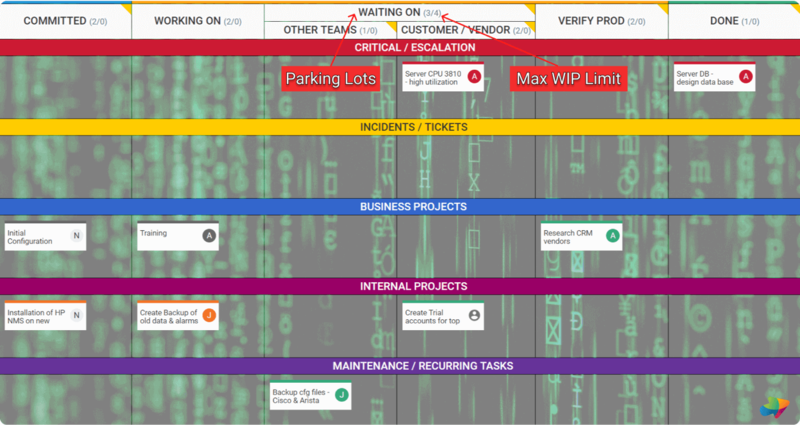 In addition, it would be wise to visualize the definition of ready, or if we stick to the Kanban terminology – pull criteria. The best place, of course, is on the board itself. When the first couple of steps toward transitioning to fit-for-purpose Kanban implementation become a natural part of your day-to-day work life, you should try combining multiple boards of teams with closely-related functions (e.g. Development and QA). Your goal here is to make the handover of work more natural and keep tasks that need to be processed by both teams at a single place. This can be enhanced even further when using a Kanban software solution, because of the automation features that are present in some tools. For example, in Kanbanize, you can set up the system to send a notification to the QA team as soon as a card becomes available for testing. Next, you may draw a few swimlanes to separate your projects and keep all assignments related to them grouped. To conclude the transition toward maturity Level 3 (in respect to visualization), you should visualize the dependencies between tasks on your board and dedicate a column to tasks waiting on external stakeholders. Visualizing dependencies on a physical board is quite tricky and usually requires treads of fabric connected to each other. However, there’s an easier way available for teams that are not afraid to take their Kanban implementation digital. To reach maturity Level 3, your goal should be to make transparent the dependencies between parent-child and peer-peer assignments. The most simple explanation of this type of the first dependency is a parent assignment consisting of one or many child cards that need to be completed before the parent can be considered done or you can begin processing it (if there’s further action to be taken). Peer-peer relationship, on the other hand, is when two tasks are related to one another but neither is superior. When using an online Kanban board, you won’t have to deal with the thread situation but instead just connect the cards through the dependency mechanism of the tool and monitor child progress on the parent card itself. Not only that you’ll save a lot of time trying to keep your board neat, but once again you can rely on automatic notifications to let you know that progress has been made. Continuing upstream, you need to enhance your Kanban board to give you a better view over the available options that await your team to work on. To do so, you need to break down the “Requested” section of your board further and add a few steps between the task initiation on the board and the commitment step. The steps should be dedicated to defining an assignment and analyzing the requirements to actually finish it. You would do well to dedicate some space for visualizing abandoned ideas by drawing a separate swimlane for such cards below the upstream section of the board. Next, you should make sure that your team knows when new tasks should be pulled downstream towards commitment. A simple way to do so is putting a minimal WIP limit on your upstream columns. Make sure that there’s an indication when a task should be pulled further downstream (e.g. using card tags) and keep the board up to date so there’s no chance to have idle capacity too often. 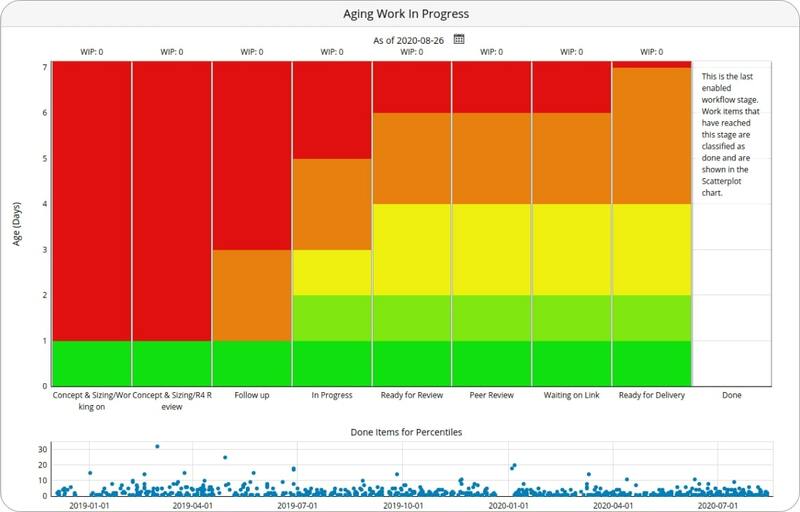 Continuing with the core visualization practices of maturity Level 3, it is important to visualize aging work in progress so you can maintain the efficiency of your workflow and react early to signs of trouble. Kanban software solutions are great for helping you with that because they provide a variety of features that allow you to visualize aging WIP such as age indicator on each card, analytics dedicated to the purpose, and even the ability to change card color as it reaches a specific age. Building on this, you can rely on software solutions to help you with the next visualization practice of maturity Level 3 that requires you to visualize target dates or SLA of your assignments. Their added functionalities will keep your team aware of approaching deadlines without you having to remind them. Depending on your software of choice, you may have different features like card deadline indicator, email notifications for approaching deadlines, changing card color automatically when a deadline is close by, etc. Although Level 3 has some serious focus on the upstream part of your workflow, there’s no absence of action to be taken on the downstream as well. Like it or not, waste is an inevitable part of any process and sometimes work in progress has to be abandoned due to some circumstances. As a result, it is a good practice to visualize work that has been worked on but forsaken on your board. You can either dedicate a column for such cards or simply put a tag indicating that they haven’t been finished and put them to “Done”, so you can learn from each failure and avoid making a mistake twice. Before you are ready to initiate the transition to maturity Level 4, there’s a final couple of things that you need to make part of your daily office life. One of them is visualizing different types of work or classes of service on your board. You can do that either with card colors or dedicated swimlanes. The second option is more popular, because in any kind of Kanban implementation, the higher the card’s position on the board, the higher its priority is. Therefore, when distinguishing between different classes of service or types of assignments, it is a good idea to put the type of work with the highest priority on the top swimlane and continue downward using this logic. 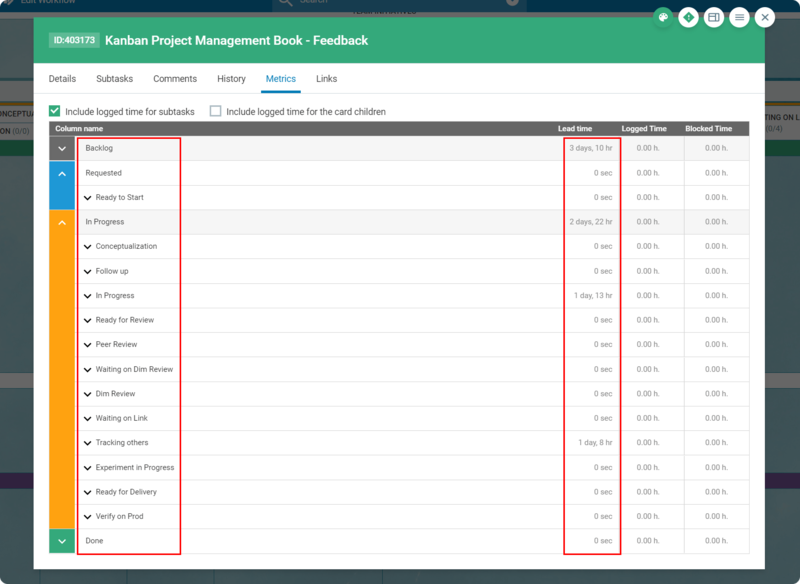 Finally, before starting the transition to Level 4, you should advance your Portfolio Kanban implementation further by turning your portfolio board into an Earned Value portfolio Kanban board to visualize project progress and schedule or budget risk. Similarly to the previous maturity levels, when advancing toward fit-for-purpose Kanban Implementation, you need to enhance the already established practices for limiting work in progress. However, once you’ve achieved a customer-driven level of limiting WIP, you can proceed to maturity Level 3 without having to go through a transition. First, you need to establish a minimum limit for upstream replenishment of tasks. Your goal is to have a constant stream of ideas for work items advancing to your commitment point. The minimum WIP limit will signal you that your pool of ideas needs to be replenished as soon as your team hits it. After you set up a replenishment point, you need to ensure that you don’t overburden the team that operates upstream. In other words, you have to put a maximum limit to the cards that can reside in any upstream column. The last practice associated with limiting work at maturity Level 3 is putting a bracket WIP limit for the different stages of your workflow. For example, if your development and QA teams work on a single board, you need to put separate limits to their stages combining all columns related to a team. Maturity Levels 0-2 should have allowed you to lay a stable foundation for managing a complex workflow, but when you start transitioning toward maturity Level 3, there’s plenty to do in this regard. The transition to level 3 consists of 7 practices in total. As most of them are tweaks to your management style, we’ll just mention them and put attention to those related to using Kanban boards in particular. Implementing all of these practices is necessary to step firmly on maturity Level 3. Once you’ve managed to organize your team around specific services and have deferred commitment, it’s time to start managing the stability of your workflow. Its main purpose is to show you how stable your flow is and help you understand where you need to focus in order to make your process more predictable. It gives you both quantitative and qualitative insight into both past and existing problems and can visualize massive amounts of data. Although the CFD might look confusing at the beginning, it is quite simple really. This simple visualization is one of the most serious advantages of online Kanban boards as it provides you with truly important workflow data that’s nearly impossible to replicate with physical Kanban boards. At this point, you’re halfway through the transition. 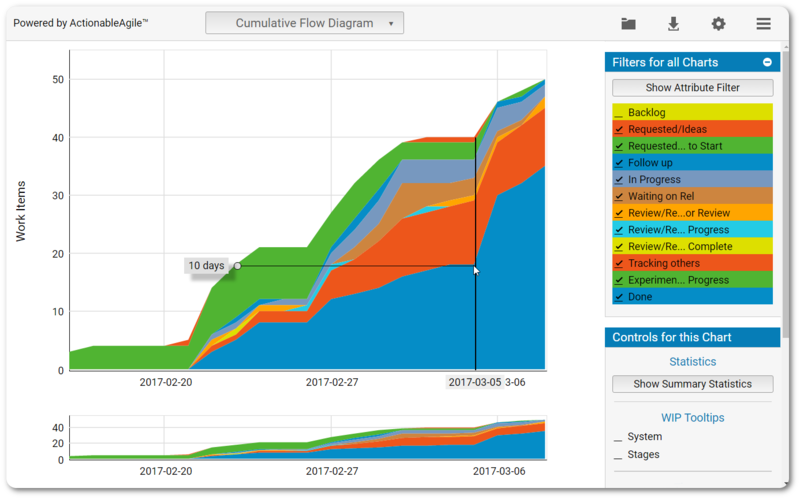 After you’ve tamed your workflow using a CFD, you need to put into practice some Kanban planning using Little’s Law. It is quite a simple way to forecast the delivery time of your assignments by dividing WIP by lead time. If your workflow is predictable, then Little’s Law can let you breathe easily when committing to a deadline. If not, then you are not ready to take this step. Next, you need to remove the infinite buffers from your process and leave only the ones that ensure smooth flow of work without slowing it down too much. To understand the value of removing buffers from your system, you need to be vigilant of your flow efficiency. Therefore, it is no surprise that the next step in maturing is related to this. Flow efficiency charts automate the whole process listed in point 1 and allow you to focus on actually using the data inside. To conclude the transition, you need to make a habit of actively closing upstream requests which meet the abandonment criteria. Although all six items on this checklist are important, you need to put special attention on managing dependencies. Failing to do so effectively can easily revert you back to maturity Level 2. Dependencies increase risk. Therefore, their proper visualization and management are important for meeting customer expectations. 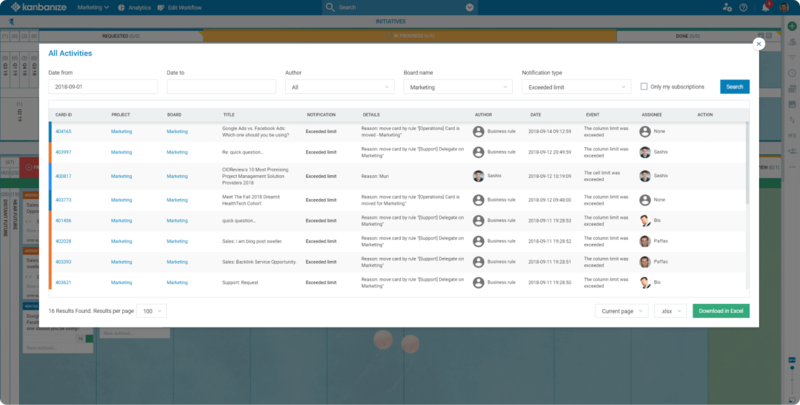 If you decide to take your Kanban implementation digital, you can easily monitor dependencies progress and get notified as soon as problems occur. At maturity Level 2, you defined your initial process policies, but as soon as you start ascending to fit-for-purpose Kanban implementation, you’ll have a new checklist to tackle before reaching it. There’s little reason to dwell on why you need to establish the explicit purpose of the metrics you choose to monitor as KPI so to summarize it, it is enough to say that by doing so, you will be able to distinguish between true performance indicators and vanity metrics. By establishing initial request acceptance policies, you’ll be able to reduce the lead time of your tasks and provide you with time to define the assignment before committing it. After you’ve decided on what your request acceptance policies are, just put them as descriptions under each column on your board they apply to. On the other hand, defining work request abandonment policies will allow you to drop committed tasks that have not been started for a certain amount of time and are not likely to be processed as well. Once again, you can list the abandonment criteria below the column they apply to. We’ve already covered the upstream practices for flowing work down toward commitment, so logically you need to define a specific replenishment point, which when crossed, there’s no going back from. Typically this would be the last “Requested” column of your board. Pull criteria are important for making sure that you are starting only tasks that you are actually ready to process. They may vary for different classes of services, so you should take your time when establishing them. A simple way to visualize pull criteria is to list any criterium that you have as a subtask on the card visualizing the task of interest. Establishing a delivery commitment point is the next thing you need to do on the way to maturity Level 4. The most simple way to do so is to dedicate a column on your Kanban board right before delivering value to the market. It can be the “Done” column or the last “In Progress” stage (e.g. Ready for deployment). Afterward, you should proceed to establishing customer acceptance criteria and defining classes of services. Classes of services allow you to manage work depending on your customers’ expectations. The first four Kanban practices are strongly addressed at maturity Level 3. The last two – Implementing feedback loops and evolve experimentally are mostly related to team communication. We don’t think we can build on the detailed explanations the authors of the model Mr. David Anderson and Ms. Teodora Bozheva have provided so we won’t be going through them. Still, we can’t stress out the importance of identifying sources of delay, which are part of the transition period toward maturity level 3 in regard to evolving experimentally. In most cases, you’ll use a sticker that shows that a task is blocked and if you are using a software solution, it will probably explain why. Take your time to study these sources and look for ways to avoid them in the future. Kanban maturity Level 4 is characterized by a risk hedged process and data-driven decisions. It is characterized more by the adoption of Kanban Cadences and adoption of the Fit-For-Purpose Framework than specific kanban board designs. Still, there’s some serious progress to be made regarding workflow visualization and managing flow. While ascending from ML3 to ML4 and above, the model becomes more focused on evolving your management practices and the process itself. Unlike levels 0 through 3, practices related to workflow visualization are not the majority of factors that drive organizational maturity forward at ML4. Both the transition and core practices are by far fewer than before, yet their significance is not diminished. Local cycle time is the time a work item spends in a specific activity or a defined sequence of activities. Simply explained, it is the amount of time that a card spends at a certain stage of your process (e.g. development). To visualize local cycle time you need to indicate how much time a task spends in each process stage. Some teams that stick with physical implementation even at this level, mark with dots the days a card has spent in any given column. As this is not a commonly-developed feature in online Kanban boards, teams that prefer this way of the method’s implementation may write inside the card’s description the date a card enters a stage and the date it leaves it. Next, you need to indicate risks by applying card decorators. This can happen simply by using different colors for tasks depending on the risk to miss your targeted SLA. Even further, if you’ve adopted an online Kanban board solution, you can use more sophisticated means such as automatically changing colors when you get close to a deadline or pass it. Also, if using Kanbanize, you’ll have a variety of stickers that can help you indicate risks even more easily. Another option is to visualize different risk classes with separate swimlanes. The logic is pretty simple, define multiple levels of risk and dedicate each of them a swimlane. Visualize tasks on the swimlane they are best attributed. The last transition step is to splitting and merging workflows. It is important to understand here that this relates to splitting a task into a couple or multiple cards that can be processed simultaneously so your team can work on them in parallel. 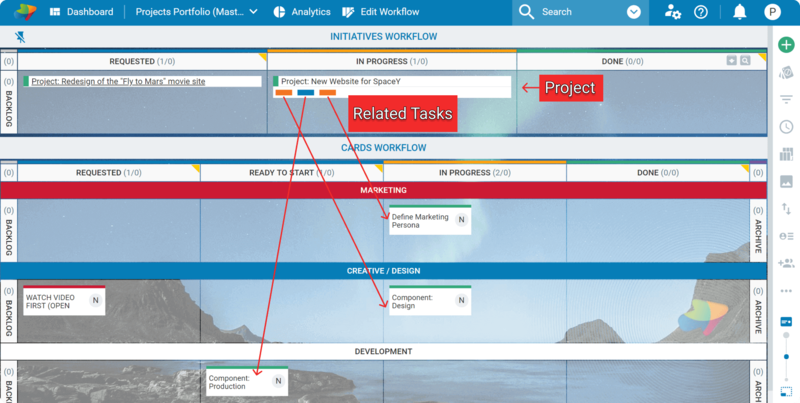 A simple way to do so using a Portfolio Kanban software is to visualize large tasks as initiatives and break them down into quick to process cards that can be delegated to your team. As a result, when all of them are finished the initiative can be considered completed and moved to Done. At the core of maturity Level 4, you’ve got to put your dependencies parking lot under complete control. Here, you need to put a maximum WIP limit to the column serving for the purpose and visualize this limit clearly on top of the stage. Afterward, you’ve got to visualize the time cards spend in the parking lot. You can do that in an identical manner to visualizing local cycle time by listing entering and exit date inside the card or marking each day passing with a dot beside the card on the board. Last but not least, you need to know when a card waiting on something passes the agreed SLA. A simple way to visualize this on an electronic Kanban board is to automatically change the card’s color as soon as it passes the SLA. Managing flow is the most heavily-addressed Kanban practice at ML 4. There’s a total of 12 steps to be taken in order to progress from a fit-for-purpose Kanban implementation to a risk hedged one in regards to flow management. At maturity Level 3, you learned how to measure flow efficiency. 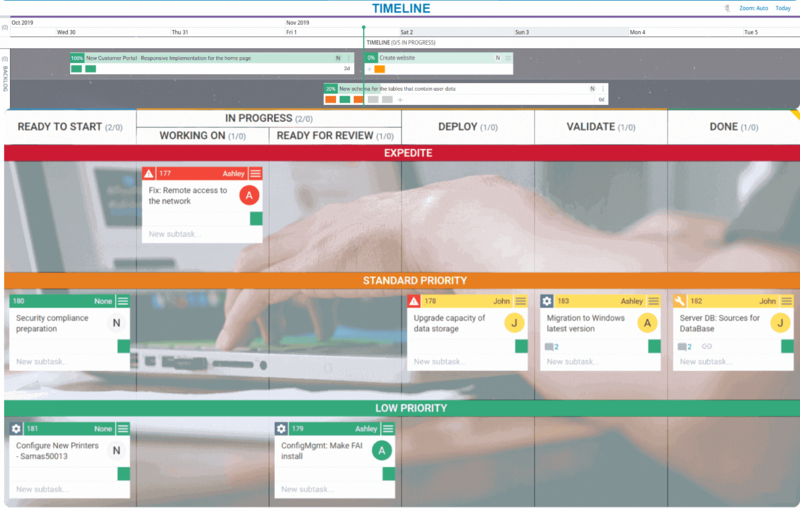 If you are using Kanban software, you can make the transition from measuring to collecting and reporting with just a few clicks and gain momentum in the process of maturing. Once again, you need to pay attention to the buffers of your process and use them to smooth your workflow. It is wise to place a buffer column (or multiple ones) before a process bottleneck to prevent it from clogging your process. Two-phase commitment allows you to manage customer expectations. 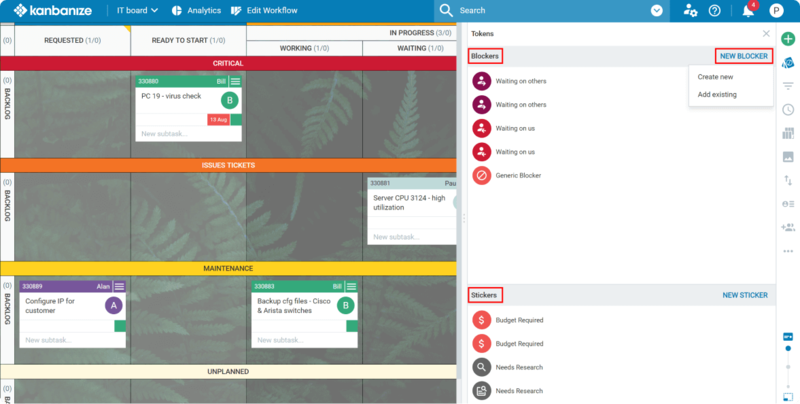 By implementing a second commitment point in your workflow you’ll be able to flow a task downstream without committing to a specific deadline from the very start. This way as soon as you’ve reached a point of your process where you can commit to a delivery date, you do so with higher confidence and keep the risk of failing to deliver value at the promised time low. The last two items on the transition checklist are more process and less Kanban related so we won’t go over them in detail. Going straight to point #2 on our list, Monte Carlo simulations are among the most reliable ways to forecast process performance relying on past data. With their help, you’ll be able to forecast cycle time and throughput based on a large number of random simulations using past performance data. Building on this you’ll be able to manage and experiment with your capacity in a better way and test allocating capacity across swimlanes or types of assignments (if using colors to differentiate them). Be sure to make the most of forecasting and stop relying on gut feeling, but on statistical methods for making data-driven decisions. Once again, the rest of the Maturity Model’s practices are a bit more empirical. You can learn more about them in the book “Kanban Maturity Model: Evolving Fit-for-Purpose Organization” by David J. Anderson and Teodora Bozheva. You should be extremely proud of yourself and your team if you managed to reach a point of maturity that allows you to look up to achieving the final couple of levels of the KMM. They are focused on building a robust process and ensuring long-term organizational survivability. With respect to visualization, the last step you can take is to visualize fixed teams and floating workers (shared resources) across aggregated services. On these levels, there’s nothing more to do regarding limiting WIP, so you can be confident that you’ve mastered them at this point of maturity. What’s left is to utilize hybrid fixed service teams together with a flexible labor pool and align strategy and capability. The Kanban Maturity Model is designed to map the implementation of all six Kanban practices throughout any organization. While advancing through the 7 levels, you and your team will obtain deeper understanding of your process and evolve it to become robust and antifragile.